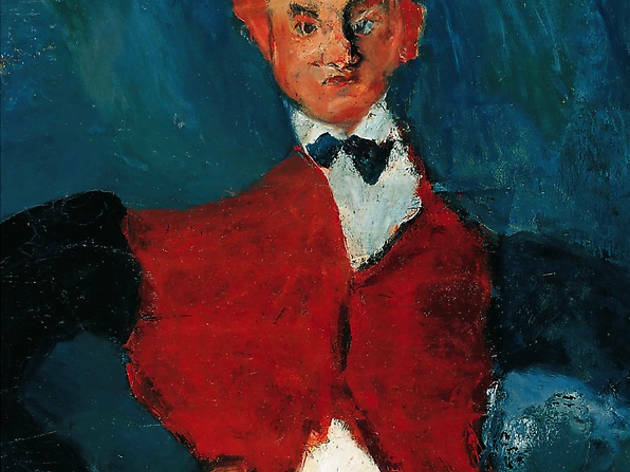 Chaïm Soutine isn’t the most original artist that you’ll see in Paris this year – the themes of his exhibition at the Musée de l’Orangerie are profoundly classical ­– portraits, landscapes, still life. His references are also quite academic – he was heavily influenced by his frequent visits to the Louvre when he arrived in Paris in 1910, and drew inspiration from Fouquet, Rembrandt, Ingres and Courbet in the composition of his portraits. But this is no criticism; even a century later, Soutine’s works are bubbling over with tortured emotion, infused with movement and colour. When the Frenchman of Russian origin sketches the landscapes of Céret, they seem to have been ravaged by an earthquake. Ripped apart and re-moulded, the perspective is skewed through tangles of trees bent like reeds. Villages explode, streets are lost, wind devastates a convulsing panorama that becomes a pile of forms and colours that the formidable brushwork renders even more feverish. In his still lifes, Soutine sketches bloody red gladioli, corpses of rabbits bruised by death and flayed beef carcasses, flamboyantly obscene flesh and blood spread over the canvases. And in his portraits, his subjects are deformed and seething, their faces crude and rubbery, seeming to be in the middle of melting or rotting; their hands are twisted and spidery, becoming monstrous excrescences at the end of disproportionate arms. It’s only their elegant outfits that stop them from collapsing. A friend of Modigliani, Matisse and Picasso perhaps owes his lack of notoriety to his darkness, or to the difficulty that historians have had in pigeonholing him. 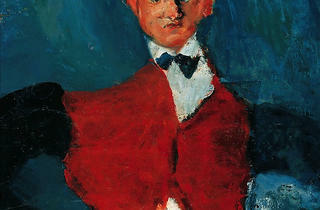 Clearly influenced by expressionism, the unclassifiable Soutine recalls at different moments both Van Gogh and Schiele, prefiguring abstractionism and the work of Francis Bacon and Lucien Freud. But aside from comparisons, the exhibition at l’Orangerie shows what is essential: his work. Work where beauty and ugliness wrestle together with devastating emotion, riven by an irrepressible energy, where Soutine seems in the same moment to seek focus and freedom. All in all, a majestic collection, somewhere between order and chaos.